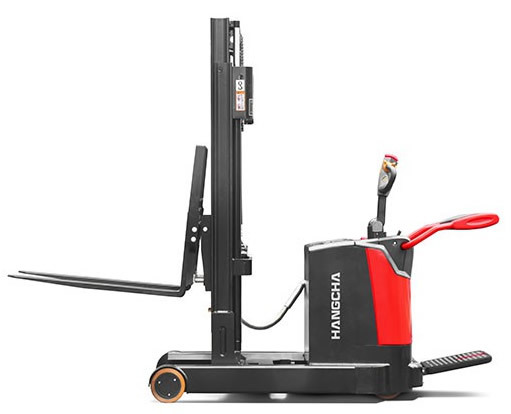 The versatile 1.2 – 1.6t stacker combines the benefits of a regular stacker with a counterbalanced stacker, making it ideally suited for transporting non-standard pallets, enclosed pallets and enclosed shelves. The mast can be retracted, reducing passage width significantly, making it ideal for operation in narrow aisles. The built-in pump motor provides a more accurate fork movement, whilst leading edge Curtis AC control technology offers excellent performance, comfortable operation, safety and reliability. Travelling speed is automatically reduced after fork is lifted higher than 500mm and turning speed is automatically reduced when steering. Anti-sliding functionality is built in to ensure safety of operation on slopes.